Want to see my room? I was dusting and vacuuming Gwen's room this morning, and decided it was time to pick up the thread on our house tour, so I got out Nick's fancy camera and snapped a few shots. Care to see? Where the tiny magic happens. So, as you can see, I'm a big fan of keeping things fairly simple in kid's rooms. I love a lot of the gorgeous themed children's rooms that I see, but prefer keeping the big things pretty basic and rather switching out the details as the kid's preferences and interests change and grow along with them. So the decorations in Gwen's room are mostly pictures I've printed and washi taped to the walls, banners from parties, and a few toys. That will change in time as we find things that we want to include more permanently and Gwen begins to put her own mark on her room, but for now I think we're happy with a simpler, cleaner look with a few fun details. The fairy garland from Gwen's first birthday was so cute I couldn't bear to part with it, so now it lives on in Gwen's room. All of the rooms in our house were painted the same creamy mocha-ish color with darker trim when we moved in, and we really liked how it looks. In fact, we liked having a unified look throughout the house so much that we haven't painted and don't intend to for a very long time. Which explains the lack of pink in this little girl's room! Honestly, though, I love the freedom that a neutral background offers. I feel like we can basically put anything we want to in our home without worrying about whether or not it "goes". A tea party for the bunnies. 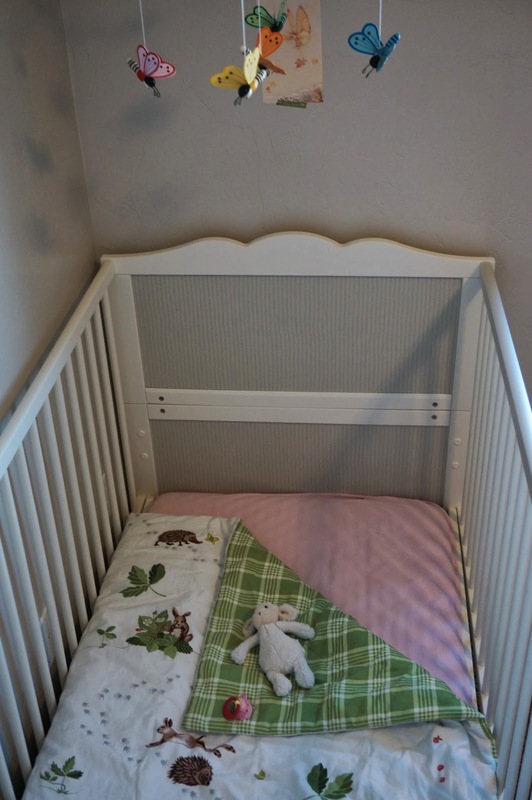 In Gwen's room we've kept the same white nursery furniture that we used in Espen's room in Spanish Fork. It's clean, simple and fairly versatile. The crib converts into a toddler bed, and the bookshelf has a changing table that bolts onto the front - which we removed once Gwen started scaling the shelves. We now have a changing pad on the floor instead, as you can see on the left in the picture above. Not wildly pretty, but very practical. Some toys by the changing pad to keep those busy hands distracted. And to keep our busy Miss occupied during diaper changes, we have a bin filled with toys beside the changing pad, although she usually prefers the bookshelf on the other side. It is never this tidy when it's not having its picture taken. Because I like to keep books within easy reach for little hands, we keep Gwen's books on the bottom shelf, which happens to be right next to her changing pad. More often than not when we're changing her, Gwen will grab a book for a quick read. And, although we didn't plan it this way when we put it next to the bookshelf, the changing pad makes a comfy little spot for reading (don't worry, we keep it clean!). Paper butterflies and the paper banner from Gwen's baby blessing. Because she still spends more than half the day there (lucky! ), I wanted Gwen's bed to be a safe and cozy little spot where she would like to be. As soon as she was big enough to really move around on her own, I got Gwen a duvet for her crib. One of the very last holdouts of my Norwegian-ness will always be my love of duvets, and now I am passing it on to the next generation. It's absolutely a preference thing and probably has a lot to do with what you are used to, but I just find them so much more comfortable and practical than sheets and blankets. We get our crib-sized duvets and covers at IKEA. The next step was to hang her butterfly mobile above her bed in a spot where she can see and enjoy it, but not reach it. We usually give it a little spin when we say goodnight to her so she can watch the butterflies dance as she falls asleep. I also hung this sweet little print from Paper Coterie above her crib, which makes me smile. You can see a little fairy picture above, but I think that's on its way out. The colors aren't quite right, and I don't want to overdo it with fairies. I think I want a poster with with "let her sleep, for when she wakes she will shake the world" on it. If I can get past the fact that I'd be hanging a quote about China said by Napoleon on my daughter's wall. Fitting though, don't you think? 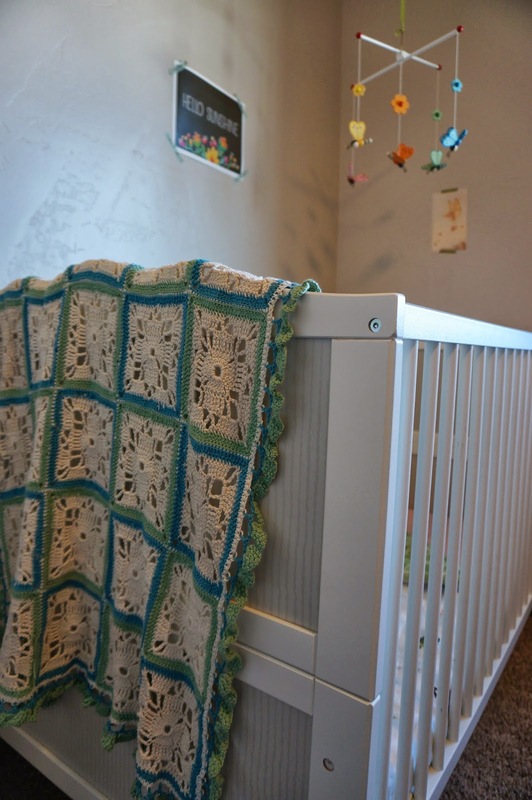 The Adelheid blanket - named for our good friend who has crocheted gorgeous blankets for each of our kids. Pacifier and Lamby - the bedtime essentials. Like most small children, Gwen has a few bedtime must-haves. At the tippy top of that list is her trusty pacifier than she cannot sleep without. It will be a sad day all round when we have to say goodbye to that little friend, because right now we just pop it in and she falls asleep! Lamby comes in as a close second. He is very soft and just the right size for Gwen to snuggle up to her cheek at bedtime. And then there's her Adelheid blanket (made by a good friend) that she will often snuggle to her other cheek when she goes to bed. As long as we have those three things, Gwen can be convinced to go to bed just about anywhere. This tiny climber loves to push the buttons on her baby monitor. Such fun! Other than that, there's not really a lot of other things in her room. We keep a little table for things her baby monitor or maybe a humidifier if she's sick. There's a closet stuffed to embarrassment with clothes for this little girl, but it's in a corner of the room that's hard to photograph and still a bit too plain and simple. There was an armchair where the footstool is, but now that the middle of the night feedings are over, we've moved it downstairs to the playroom where it gets a bit more use. I find that, as this is a family home, our rooms are always changing and evolving as we do too. Nothing is ever complete or perfect, but then again, neither are we. Wild and ladylike - just like our Gweny. Thanks for reading! I enjoy doing these little tours of our home just as a way of documenting our own little family story, and if you enjoy seeing and reading about how we live, then I really could't ask for more. I didn't put together a resource guide this time, but just let me know if there's anything you'd like to know where we found, and I'll tell you! No treats - I did it!